The "What in Tarnation" meme began as many do, with an image of a dog, in this case, a Shiba Inu wearing a cowboy hat. Sometimes it has southern-related captions, such as "sorry, we don't have sweet tea." Other times, the meme involves words that rhyme with tarnation – carnation, taxation, pollination, filtration, formation (Queen Bae) and just about anything that ends in "tion." What Do &apos;What in Tarnation&apos; Memes Mean? Sometimes these memes mean what the heck and other times there's a play on words. 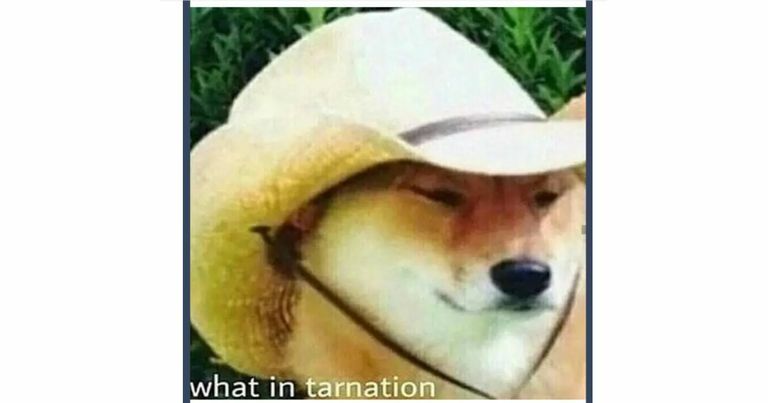 How Are &apos;What in Tarnation&apos; Memes Used? Tarnation memes are used to express confusion or anger at a situation or in a silly variation with a rhyming word. Meaning: Bees like memes too. They're just like us. Image: James Otis, who coined the phrase "taxation without representation is tyranny." Meaning: The tarnation of its day. Text: When you're home alone and you hear the TV turn on by itself. What in tarnation? Meaning: Tarnation is the only response to a possessed television. Bee Movie 2: The Existential Crisis. Patriotic tarnation in the lead-up to the American Revolution. How could we leave out POTUS # 44? WTF is a WTF meme?